The project took 15 months to complete and cost the council over three million euros. The work consisted of, “improvements to the 20 year-old promenade which involved repaving, replacing the furniture, creating accesses to the beach, public lighting and services such as the provision of toilets, showers and security. The mayor of Arona, José Alberto González Reverón emphasised that, “following the improvements, we have achieved a promenade which is 15 metres wide with a border which meets the sand on the beach. It is much more pleasant than before and you can see all of the beach”. He recently visited the site with the councillor for urbanisation and the environment, Antonio Sosa, and spoke of the importance of this project which, “has left us with a spectacular result. Now Los Cristianos has a promenade which is absolutely integrated with the beach and which gives the town the beauty and urban quality which a holiday destination such as this should have”. At the same time, he stressed that, “the development of this project has made it possible to integrate the concepts of sustainable development and equilibrium in a tourist area, with increased commercial activity and increased pedestrian traffic on a promenade which overlooks the largest area of beach on the island”. The new promenade now has ample seating available overlooking a garden area to the beach. 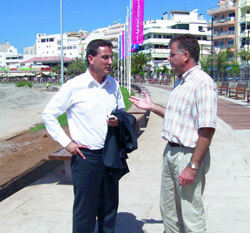 The works were complementary to the infrastructures and tourism quality plan as well as the business plan, both of which also involved the Canarian government and the Cabildo of Tenerife, with the objective of improving the image of Los Cristianos and regenerating tourist areas to maintain the district as a competitive holiday destination. “To these three projects”, Reverón concluded, “we have to add the regeneration of the historical beach of Los Cristianos which is already under way, and the future redesign of the port”.